As a specialist in Teflon®, Silicone and Stainless Steel fabricated process hose assemblies, our vast applications expertise enables us to solve problems for your most challenging projects. If you’re in need of a unique flexible component, our Expansion Joint, Loading Arm, Swivel Joint & Rotary Union offering is world class. Hose Master Inc. is the industry leader in manufacturing quality corrugated and stripwound metal hose. A combination of engineering innovation and years of metal hose experience allows us to provide unique, cost saving solutions to difficult applications. Flexaust Industrial is the leading manufacturer of flexible lightweight rubber, plastic and polyurethane hose and duct for industrial high temperature air, fume exhaust, dust collection and material handling applications. Hansen Coupling The Industry Standard for Quick Couplings. Tuthill Coupling Group, comprised of Hansen Couplings and Coupleurs Gromelle, manufactures couplings to handle a wide variety of fluids, gases, air and hydraulic oil. Gas and Cryogenic Hose A wide variety of hose products for the compressed gas and cryogenic hose market including pigtails, tube trailer hose, liquid cylinder hose, bulk tank truck hose, cryogenic pump and vaporizer hose and gas/liquid sampling hose reels. Campbell Fittings, Inc. manufactures the world's finest industrial hose fittings, couplings, clamps, ferrules, and related tools & accessories for air, steam, gas, water, dry bulk, chemicals, and petroleum applications. Dixon hose couplings have been carefully engineered to meet specific requirements with large safety margins. 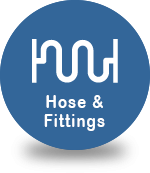 If hose or couplings are not used in correct applications or are incorrectly applied, accidents and downtime can result. Whether you need to convey materials or move equipment, Gates industrial hoses and hydraulics will give you the application coverage you need for your job. Weatherhead has consistently delivered innovative solutions at every turn. A leaking hose shuts an operation down. The speed at which it can be replaced directly affects your efficency and bottom line. Weatherhead's Coll-O-Crimp® System enables custom hose assemblies to be quickly fabricated, even out in the field. Masterduct produces a wide variety of lightweight, flexible, abrasive resistant, heat tolerant, innovative technical hoses to provide solutions for a wide range of industrial applications. Hannay Reels handcrafts hose reels and cable reels for standard, custom, OEM, and aftermarket reel applications. Built with heavy-gauge steel and exclusive features that help absorb the punishment delivered by even the most demanding applications.